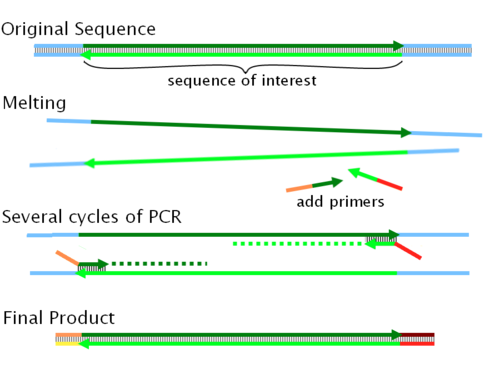 Gibson Assembly is a means of joining overlapping DNA sequences - and these are generally created by polymerase chain reaction (PCR) mediated extension. We can add twenty base-pairs to the end of a sequence by using a primer which runs as follows from 5' to 3'. If we wish to ligate two sequences called A and B (in that order) we need to ensure that there is an overlap of 40bp: i.e. the end of sequence A has the same 40 bp as the beginning of sequence B. We now perform two separate PCRs, one on A and one on B. The first adds the beginning 20 bp of B to sequence A by using a ~40nt primer as detailed in the figure above (Note: the diagram shows both ends being extended -often necessary to perform multiple ligations at once). The second adds the final 20 bp of A to sequence B. The end of A and the beginning of B now are composed of the same 40bp sequence (end of A + beginning of B), and we are now ready to use Gibson Assembly. The Cambridge iGEM2010 team have developed Gibthon to help you design primers for Gibson Assembly. The tool allows you to put in two sequences and choose 20bp of each to get a 40bp primer; it then analyses the melting temperature and secondary structure of this primer. Once it has chewed back far enough A-T G-C base pairing allows the two pieces to bind together. We now have a single piece of DNA but it is not physically ligated together, it is merely held together by hydrogen bonding, also there are gaps in both single strands. Phusion is a DNA polymerase that repairs these gaps. It extends from the 3' end, so it does not interfere with T5 exonuclease which is acting at 5' ends. Now we have DNA with no missing fragments but there is still a break in the phosphodiester bonds in the backbones of both single strands of DNA. This is corrected when Taq ligase action forms this bond. And finally we have our finished piece of DNA.